The Monitoring the Future survey shows that past 30-day cigarette use among 12th graders dropped from 16.3% in 2013, to 13.6% in 2014, the largest single-year decline in the survey's 39-year history (data here). The data show that 17% of 12th graders had used e-cigarettes in the past 30 days in 2014, the first year this information was collected. 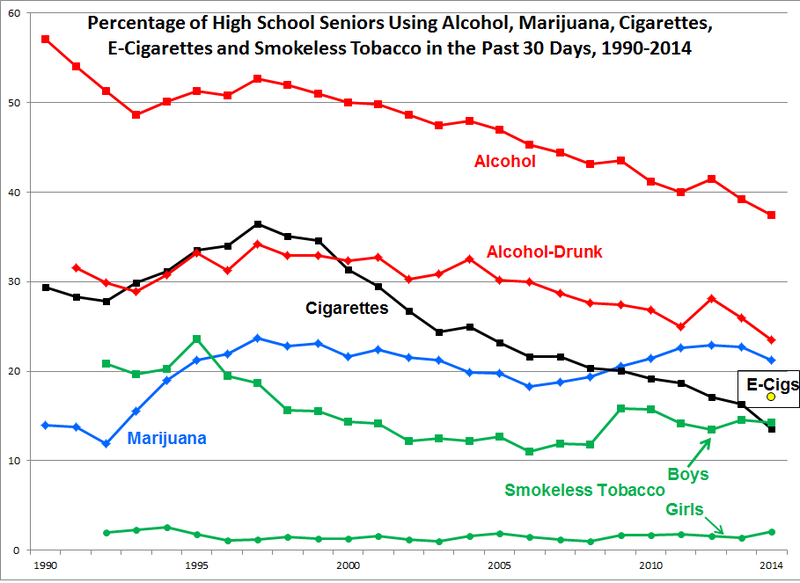 Good news included a decline in the percentages of high school seniors reporting alcohol use, being drunk and marijuana use in the past 30 days. Smoking prevalence among high school seniors has declined every year since 2007, about the time that e-cigarettes were introduced in the U.S. With numbers like this, claims that e-cigarettes cause children to smoke are completely unfounded. In fact, the evidence is strongly suggestive that e-cigarettes have played a role in this unprecedented decline in teen smoking. If reading’s not your thing, you can now get the facts on smokeless tobacco and tobacco harm reduction via two new offerings – the audiobook version of my updated text, “For Smokers Only” (here) and a lively YouTube conversation on the issues with Darcy Compton, president of Mudjug (click on the video). I started advocating for smokers to switch to vastly safer smokeless tobacco products some 20 years ago, when my research showed that health risks related to smokeless use were but a tiny fraction of those associated with smoking. Last year, my publisher released the ebook version, updated with a fresh chapter on e-cigarettes. It’s available at Amazon (here), Barnes and Noble (here) and ITunes (here). Now he’s issued the audiobook version, downloadable at Audible.com (here). Darcy Compton, California manufacturer of Mudjug portable spittoons (here), has developed a global online following. His YouTube review of “For Smokers Only” has attracted some 225,000 visitors (here). Darcy and I recently sat down for a lengthy conversation on all aspects of smokeless tobacco use. I am indebted to Darcy and Mudjug for their vocal support of my scientific findings and groundbreaking work in tobacco harm reduction. The original warning labels that Congress ordered for tobacco product packages in 1986 were factually wrong and fatally misleading to smokers, chewers and dippers. Congress didn’t make the warnings more accurate when it ordered the FDA to regulate tobacco in 2009, it just made them cover more of the package – an action it didn’t take with cigarettes. The Times editorial acknowledged that snus is “is less harmful than smoking tobacco,” but it painted Swedish Match’s application as a marketing ploy. That ignores the critical need to terminate government’s lie about products’ health risks. The editors echoed tobacco prohibitionists in denying that snus played a role in the Swedish experience. Said the Times, “reduced smoking rates and lower rates of tobacco-related diseases such as lung and oral cancer” in Sweden since the 1970s “is debatable,” attributing the successes to “various bans, restrictions and public health campaigns.” The editors failed to consider that the reductions are exclusively seen in men – who use snus and have the lowest lung cancer rate in Europe – not in women, who rank fifth in Europe for lung cancer. The Times acknowledged that their reporters had “cited independent experts who found that snus is not nearly as lethal as cigarettes,” but it added the qualifier “[snus] is not risk-free either, especially for users who also smoke.” It is patently obvious that smoking is risky for anyone, including snus users. It should also be obvious that a smokeless tobacco can labeled “this product is not a safe alternative to cigarettes” encourages smokers to stick with their habit. The Times editors revisit the discredited gateway theory (“the danger is that snus might lead some nonsmokers and former smokers to…progress on to cigarette smoking”), but they ignore substantial evidence that this has not happened in Sweden (here) or in the U.S. (here). Summing up, the Times observes: “abstention would be the safest approach.” That might work in Neverland, but in the U.S., abstention was impossible for the 8 million smokers who died in the 20 years since I first described our government’s warnings as bogus. That is no one’s definition of safe. The New York Times has published (here) a reasonably accurate portrayal of the Swedish snus experience that I have chronicled for over a decade (here, here, and here). Reporters Matt Richtel and David Jolly examined Swedish Match’s FDA application to remove the federally mandated mouth cancer and not-safe-alternative warnings from snus products. I have discussed this landmark filing previously (here). How is the research imperfect? “For instance, some research concluding virtually no oral cancer risk from snus was funded by Swedish Match itself.” The Times fell back on the old canard – the funder influenced the finding, despite total disclosure and high-quality peer review. The paper failed to note that numerous studies, regardless of funding, show “virtually no oral cancer risk” for Swedish snus and American chew and dip. The Times asked Kristin L. Sainani, a Stanford epidemiologist not involved in tobacco research, to examine the science. She was remarkably indecisive: “‘The weight of the evidence suggests a small increase’ in the risk of oral cancer with snus. In Sweden, users of Swedish snus see virtually no increase in the rates of lip and oral cancer.” In the end she made the correct call: virtually no increase. Dr. Sainani attempted to provide an anti-snus slant using double negatives: she said that “it is inconsistent with the evidence” to suggest that there is “absolutely no harm to an individual” from snus. In essence, she repeated the no-win argument that snus can’t be proven absolutely safe. That’s an irrational standard that many common foods couldn’t meet. Dr. Sainani was asked by the Times to resolve the mouth cancer question, yet she is quoted on an entirely different matter: “In fact, she said, Swedish snus users face a doubling of risk of pancreatic cancer…” It appears that Dr. Sainani exclusively used a 2008 review by Boffetta et al., which has been exposed as relying on cherry picked data (here). Is a snus pancreas cancer risk real? No. Five years ago I detailed how Boffetta fabricated the risk in 2008 (here), and, in 2011, Boffetta acknowledged that his earlier finding was wrong (here). Sainani would have discovered this if she had compared the faulty Boffetta analysis with the most authoritative and comprehensive meta-analysis by Peter Lee and Jan Hamling (here), which found no pancreas cancer risk, in addition to no mouth cancer risk. The Times and their quoted experts did a major disservice to their audience; they failed to report the simple truth, that mouth cancer risk for Swedish snus is next to nil. The British government has just released statistics on e-cigarette use (here). The Office for National Statistics reports that e-cigarettes were used by 12% of smokers and 5% of former smokers in the UK during the first quarter of this year, but the rate of use among never smokers was only 0.14%. This is direct evidence that it is predominantly smokers who are using e-cigs, and some of them are becoming ex-smokers. 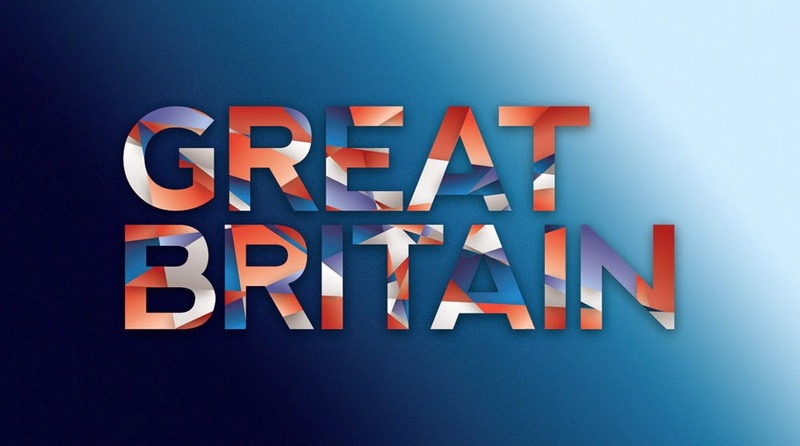 Release of the British data underscores the distressing fact that the U.S. neither collects nor publishes similar information, which is vital to intelligent public health policymaking. It is disgraceful that 10 years after the introduction of e-cigarettes and five years after a rapid acceleration in sales, the U.S. government, particularly the Centers for Disease Control, collects almost no e-cig data in its many national surveys. I emphasize “almost,” because the CDC has collected usage information among youth for the past three years, using it to mislead the public about an unsubstantiated new childhood tobacco epidemic (here and here). Acting U.S. Surgeon General Boris Lushniak recently tweeted, “@OxfordWords #Vape may be #WOTY but the increase in never-smoking youth using e-cigs is a not a trivial story.” The tweet referred to the Oxford English Dictionary’s having designated “vape” as the word of the year, and reflected a CDC report claiming that e-cigarette use among children had increased in 2013. The prevalence of e-cig use among youth who had never smoked was 0.3%. Tobacco use by youth is never trivial, but in taking an extreme position, Dr. Lushniak was acting in the tradition of previous surgeons general. In December 1992, Surgeon General Antonia Novello announced: “The majority of our experts predict an oral cancer epidemic beginning two or three decades from now if the current trends in spit tobacco use continue.” (here). That was shocking news for many, including this oral cancer expert. As an oral pathologist for 15 years at Emory University and the University of Alabama at Birmingham – deep in smokeless tobacco country – I had made microscopic diagnoses in hundreds of oral cancer cases (almost all smoker/drinkers), and I had assisted in the treatment of hundreds more. Over time, I had become increasingly bothered by the disconnect between the dogma I taught my medical and dental students (that smokeless tobacco was a death sentence for oral cancer) and what I had experienced in practice (that smokeless tobacco was almost never listed as a behavior on the pathology request forms, the rare exception being powdered dry snuff). Dr. Novello’s announcement was the catalyst for my research, which led to my first journal articles in 1994 (here and here), and my book, “For Smokers Only”, in 1995. (An updated version with a new chapter on e-cigarettes is now available in print and as an audiobook here). I testified at a 2003 Congressional hearing on tobacco harm reduction (available here), at which Surgeon General Richard Carmona also testified. (Dr. Carmona is today an NJOY director and chair of its scientific advisory committee.) 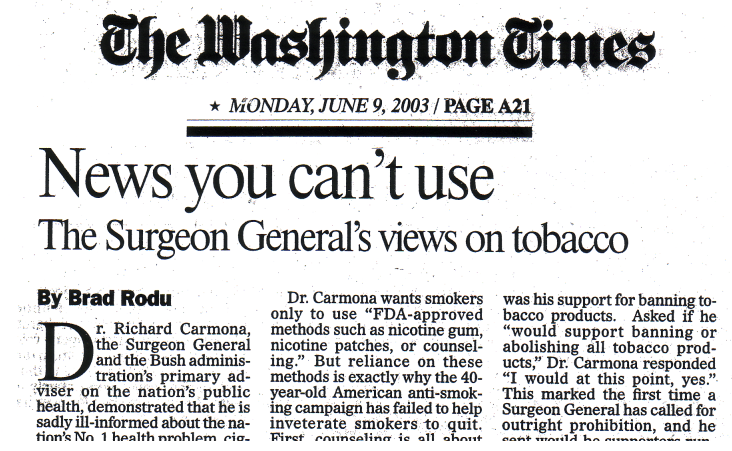 In that hearing Dr. Carmona said, “there is no significant evidence that suggests smokeless tobacco is a safer alternative to cigarettes.” I subsequently noted in a Washington Times editorial (here) that the surgeon general had ignored decades of published research and the findings of Britain’s esteemed Royal College of Physicians. Dr. Carmona so blundered in supporting a ban on all tobacco products that Bush administration officials had to backtrack. “This is not the policy of the administration,” White House spokesman Scott McClellan said, adding that Dr. Carmona’s comments reflected his views alone. The surgeon general occupies one of the most trusted positions in American medicine. The individual holding that post should speak the truth about safer cigarette substitutes, today and always.